NEW! Check out the new online practice section at MathMammoth.com. 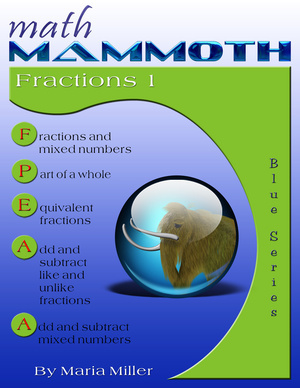 The fraction videos on this page match the lessons in my book Math Mammoth Fractions 1 (Blue Series book), or the lessons in chapter 5 of Grade 5-B (Light Blue series). In either book, you will get MANY more practice exercises, word problems, and puzzles than what are shown in the videos, and also some lessons that are not in covered in this set of videos. A self-teaching worktext that focuses on addition and subtraction of fractions & mixed numbers, among other topics. I explain both the visual models and the shortcuts for converting mixed numbers to fractions or fractions to mixed numbers. To convert a mixed number to a fraction, divide the whole "pies" into pieces (the same kind of pieces as what the fractional part indicates), then figure out how many pieces you have. You can use multiplication, of course. And to change a fraction into a mixed number, draw enough pies so you can "accommodate" all the fractional parts. The shortcut is, divide. For example, to change 16/5 into a mixed number, divide 16 by 5. That is 3 remainder 1. It means we get 3 whole "pies", and 1 remainder piece, which is a fifth, or 3 1/5. I explain how you can teach adding and subtracting like fractions, first using visual models, coloring the crossing out parts, and then advancing into abstract problems. I also include missing addend problems. In this video we study adding mixed numbers when their fractional parts are like fractions. This is not a difficult concept - all you have to remember is that if the sum of the fractional parts is more than 1, you need to convert that to "whole pies" and whatever is left over. 3. Using a negative fraction. The fractional parts have the same denominator (like fractions), which is the easier situation. It is more complicated if they are unlike fractions - dealt with in another video. Equivalent fractions - split the pieces! The visual model for equivalent fractions involves splitting the existing pieces into so many new ones, such as splitting all of them into 4 new pieces. This is shown using the arrow notation with "x4" near the arrows, signifying that the numerator and the denominator get multiplied by 4, because there are now four times as many colored pieces and four times as many pieces in total. After practicing with visual models, students can go on to abstract problems, still thinking of the arrows in their minds, to help. This is a lesson plan (over several lessons) for teaching adding unlike fractions (which I consider to be the most difficult topic in fraction arithmetic). First, I go through exercises that have a visual model, and the common denominator is given. Then, students should be given exercises without a visual model but the common denominator is still given. Lastly, we study the rule about finding the common denominator. I also have another video that concentrates solely on that. First, I show two examples with visual models of adding or subtracting mixed numbers. Then we go on to abstract problems, in which we first need to rewrite each problem so that the fractions have a common denominator, and then we can add/subtract. In subtraction, borrowing may be necessary. I also solve one word problem involving a picture frame. The least common denominator is usually taught together with the topic of adding unlike fractions. Now, I feel that fifth grade students do not yet need to know the exact mechanics of finding the least common denominator, but can simply use any common multiple they find by looking at the multiplication tables of the denominators. Then, in 6th or 7th grade, students can learn to find the least common multiple of the denominators by making two lists of multiples. There exists a method for finding the least common multiple of two (or more) numbers that uses prime factoring, but I do not deal with that in this video. - If the numerators are the same, think of the size of the parts. If none of those "work", you can always convert the two fractions so they have the same denominator, and then compare. See also free fraction videos, part 2: simplifying, multiplying, and dividing fractions; fractions to decimals; ratios and fractions, and a fractional part a group of objects. The videos match the lessons in my book Math Mammoth Fractions 1 (Blue Series book), or the lessons in chapter 5 of Grade 5-B (Light Blue series). In either book, you will get MANY more practice exercises, word problems, and puzzles than what are shown in the videos, and also some lessons that are not in covered in this set of videos. Receive my monthly collection of math tips & resources directly in your inbox — and get a FREE Math Mammoth book! How often would you like to receive the emails? Note: You will FIRST get an email that asks you to confirm your email address. If you cannot find this confirmation email, please check your SPAM/JUNK folder. Enter your email to receive math teaching tips, resources, Math Mammoth news & sales, humor, and more! I tend to send out these tips about once monthly, near the beginning of the month, but occasionally you may hear from me twice per month (and sometimes less often). Peek at the previous tips here. A GIFT of over 400 free worksheets and sample pages from my books.